Undated booklets issued by the factory at some time prior to World War II give short descriptions of the eleven models which had been developed. These models are given catalog numbers which are not consistent with the dates of introduction of the various models. Obviously model designations were not assigned to each model at the time of its introduction, but were chosen at some later date for the probable purpose of identification of the different types available to the customer and to assist him in ordering. The model numbers start at No. 10, for some unexplained reason, and continue to Mod. No. 21. They appear in 6.35, 7.65, and 9 mm. calibers. 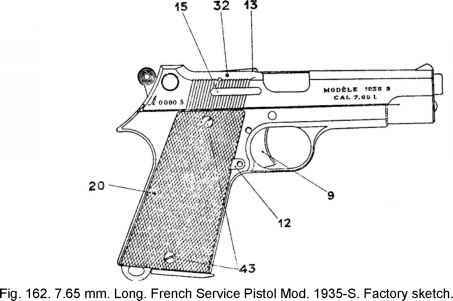 No .22 caliber pistols were produced until after the end of World War II. Each of the eleven pre-war models will now be discussed briefly. Mod. No. 10-This 6.35 mm. model with its counterpart in 7.65 mm. caliber is referred to as the Modele Classique and, no doubt, is the first model to bear this brand name. It is a typical copy of the 1906 Browning and, like most, does not have the grip safety. It has two safety features, the customary thumb safety and the magazine safety. Removal of the magazine renders the action inoperable. Like most Browning imitations, the thumb safety is located just back of the trigger guard in front of the left grip plate. This is also true for the other ten of these early models. Mod. No. 11 -This model is essentially the No. 10 with the addition of a grip safety and a cartridge indicator. The cartridge indicator is located in the top of the slide and tells whether there is a cartridge in the chamber. Models Nos. 10 and 11 were made from 1930 to 1940. Mod. No. 12-The omission of the cartridge indicator gives rise to this new nomenclature. Otherwise this pistol is identical to the No. 11, and it too is stated to have been produced from 1923 to 1940. Mod. No. 13-By increasing the magazine capacity from 6 to 7 cartridges a „new" model is created. No. 13 and No. 12 are identical except for this one feature. Mod. No. 14-To increase fire power still further, the length of the magazine was increased to take 9 cartridges. Otherwise, only minor differences are to be noted, such as a slight change in the location of the thumb safety, a change in shape of the maga zine release, a change in shape and design of the grip plates and in the pattern of the finger grip serrations on the slide. Fundamentally, it is of the No. 10 design and was made over the same period of time, i.e., 1923 to 1940. Mod. No. 15-Here we have the first 7.65 mm. „UNIQUE" to be described. Except for size and caliber this is the same Modele Classique as No. 10 and was also produced over the same period of time, i.e., 1923 to 1940. There are a few minor differences, such as the slightly raised position of the thumb safety and a notch on the lower edge of the slide for the engagement of the hook of the thumb safety, a change in the lion monogram on the grips, and the use of narrower serrations on the finger grips on the slide. It was advertised as a pistol suitable for police work, guard duty, etc. Mod. No. 16-This 7.65 mm. pistol is the same as No. 15 except that the magazine capacity has been increased from 6 to 7 cartridges. Like No. 15 it was made from 1923 to 1940. Mod No. 71-This is a somewhat larger pistol than Nos. 15 and 16 and has a magazine capacity of 9 rounds, but it is similar in design to the smaller models. This was advertised as an „Acme de Guerre, made in accord with the conditions and tolerances enumerated in the Specifications of Artillery . . ." This model and those following were provided with a lanyard ring. The pattern on the grips is slightly different in form from any seen on the preceding models, the name „UNIQUE" being curved, concave downward. Mod. No. 18-Here we have a decided departure in design from all of the preceding models, all of which had a spiral recoil spring located below the barrel, as in the 1906 Browning. Mod. No. 18 has a recoil spring surrounding the barrel, as in the 1910 Browning, and disassembly is accomplished in the same manner. The recoil spring is held in place by a sleeve (or ring) having a knurled edge. When this sleeve is rotated into the proper position it is unlocked (bayonet catch) and can be removed, together with the spring. The slide is then moved back until the hook of the thumb safety is engaged in a notch. The barrel can then be rotated until it is free and the slide and barrel can be removed. Only the thumb safety and magazine safety are provided. The magazine holds 6 cartridges. Markings are similar to those on No. 17. Mod. No. 19-By simply increasing the magazine capacity from 6 to 7 cartridges a „new" model is created. This model is simply No. 18 with increased magazine capacity. Mod. No. 20-Here again a „new" model is created by simply increasing the magazine capacity of No. 18 from 6 to 9 cartridges. The length of the two is the same but No. 20 is naturally higher and heavier. Mod. No. 21-This is the only 9 mm. caliber pistol made in this period. It is of the same design as Nos. 18 and 19, and the dimensions are the same as those for No. 19. As it has a magazine capacity of six rounds and because of the increased bore (leaving less metal) the weight is less, being 605 grams as against 615 for No. 19. Like the others it has only two safeties, the thumb safety and magazine safety. None of the 7.65 or 9 mm. models have the grip safety.